Time for another one of those shots that has stayed in my memory (both on hard drive and the grey matter between my ears ;~). We were following a sow (female bear) and her two cubs very carefully and from a safe distance. 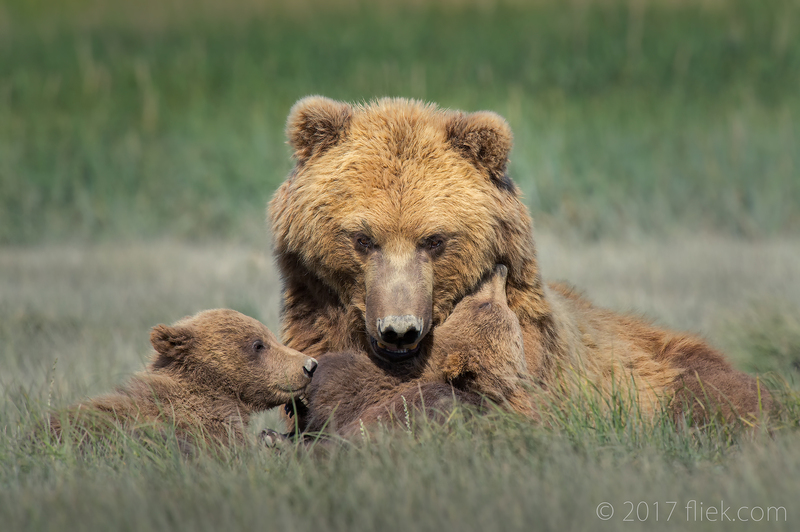 The cubs had pretty much only one thing on their mind: playing with each other and with momma bear. After some time she gave in, and it was the first and only time I had ever seen a bear smile. Perhaps it wasn’t a real smile but it certainly looked that way. She was visibly enjoying the play with her cubs. The shot below is one of those lucky ones when she had her attention on her cubs, but kept a close eye on us as well. At a certain moment she looked me right in the eye, or rather lens. In most cases you would never want to approach a sow with cubs, but I guess this was just one of those rare and magical exceptions… nature at its finest. Nikon 500mm f/4G on Nikon D4S + TC-14E II (700mm), f/11, 1/1250 s., ISO 1100, +0.3 exp. comp.